I am actually not sure who was more upset to be honest, whether it was me, or whether it was them. My husband and I have always strongly felt we wouldn’t continue to lie to them about Santa if they asked a lot of questions. It became impossible to avoid my seven year old’s queries. It was a constant, every night before he went to sleep…so in the end, we explained all about Santa, in as magical a way as we possibly could. Both my children want to carry on as if he is still as magical as he was last year, which is fine by us, we love the big man. In order to keep the magic alive, we were delighted to be able to have the opportunity to review the Portable North Pole package of a video and a phone call; just so we can keep the red fella as real to them both as he can be now. What is the Portable North Pole website? This is a wonderful website, which we have used in the past; in fact, every year we downloaded a video for the kids to see that showed them Santa checking the nice list to make sure they were on it for them to get their presents. Holiday pass (£7.49) – unlimited calls and videos, which is great if you have a few kids that you need to do this for, for example schools and nurseries could have a ball here! 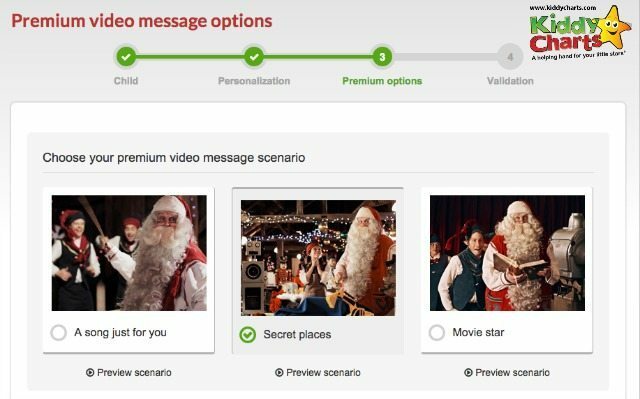 Jingle Bells Bundle (£3.99), which has a call from Santa as well as the Premium Video. This is the package that we were able to review. In addition, you can pay £4.99 so you can save all your videos in one place. In addition, you can now create videos from both an iPhone and Android App. This video gives a ittle more info on the premium video content. How do you build your personalised content on Portable North Pole? I am always concerned that these types of sites are too complicated, and take far too long to create your personalised products. However, I had both the call and the premium video created within 10 minutes. The options within the storyline are explained well too, and give you a number of scenarios that you can use for your children to make sure that the video suits their personalities. The five photos that you are able to upload are also offered around themes so that the book that your child has from Santa’s library, where he decides whether you have been naughty or nice, is well personalised, and relevant to your family. My daughter was able to see photos from her home, holiday, and a recent trip to the football that she loved. It is worth having a few photos to hand to make sure you can pick relevant shots, but as you are building on the computer, and photography tends to be digital these days, that should be easy to manage. The video asks you to say whether your child has been naughty or nice. I know this is the usual story we tell our children, but as my little boy pointed out, this can be a little scarey for the kids. I am not too sure how my kids would react to being told they were naughty….but then that’s the parent’s choice, I suppose…. Which photos you have uploaded for the book. All of these options help to make the video very relevant to your child, their behaviour, and their aspirations for Christmas. The options for the phone call to Santa are much simpler, with you choosing what the theme of the call would be, as well as basic details on your child. For example, my daughter was to be praised for doing well at school. There are a lot of other options for you, including those which try to encourage your child to behave better. You will need to use the computer to trigger the call to your home phone, so make sure your child doesn’t see, but that they are around to answer the call, you only get three chances. What did we think of Portable North Pole? It helped keeped the questions at bay last year, and for years before, even though sadly it doesn’t have the same magic now that the kids know about Santa. However, it does mean that we can keep things magical, and fun, depsite this. Suprisingly, that means a lot to us adults as well, so this isn’t just for the kids. Ultimately, it also helps parents to make the wonder of Santa more real for their children, which is a very, very good thing. With prices starting at £2.99, better video packages are also affordable too, so its not just something for those with a lot of disposable income either. The phone call, and the birthday wishes are a great addition to the site too, helping to keep the dream alive even if its isn’t actually Christmas time. That’s a top score right? That’s because we do indeed think that its a wonderful thing. In this age of technology, why not use that technology to keep some of those wonderful, imaginative ideas about Santa alive for as long as possible? In general, this is a great tool for making your Christmas with the kids even more special, and as you can either get a free package, or spend a little to get something a bit more personalised, there is something for everyone, and every pocket. Do you use the Portable North Pole – what do you think of the website and the videos and phone calls? its really really amaizng its to awesome thanks for amaizng tips.